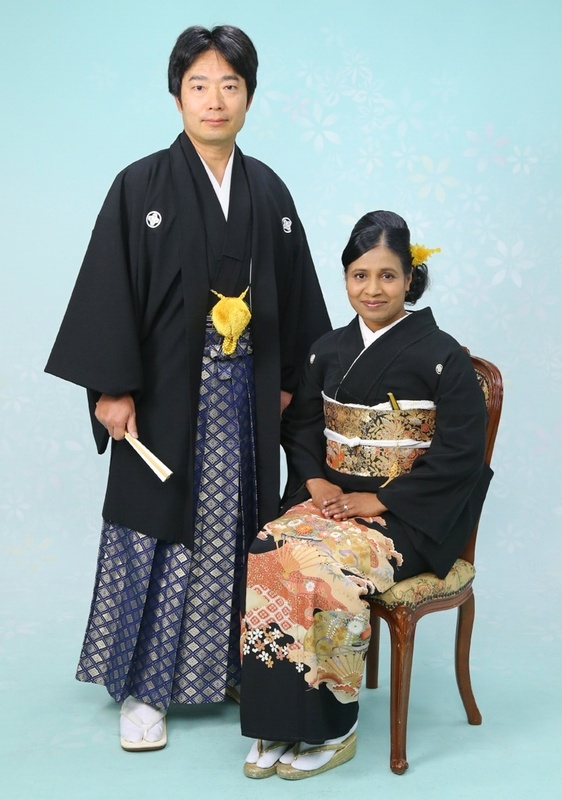 On March 31st and April 1st, hubby and I visited his ancestral home in Ichinomiya city which is located near Nagoya. 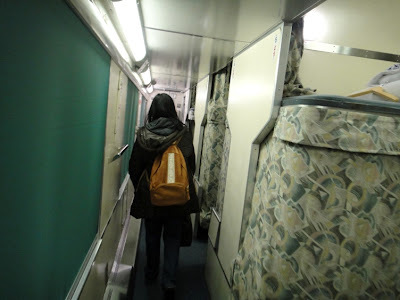 For the past couple of years, we had been planning to experience travelling by an overnight sleeper train named Akebono but somehow we always end up travelling by air. But this time we could make our wish of travelling by Akebono train come true, and on the night of March 30th we took this train at Akita railway station and reached Ueno railway station in Tokyo the next morning. It was a nice experience. Later we used Shinkansen bullet train for travelling from Tokyo to Nagoya. 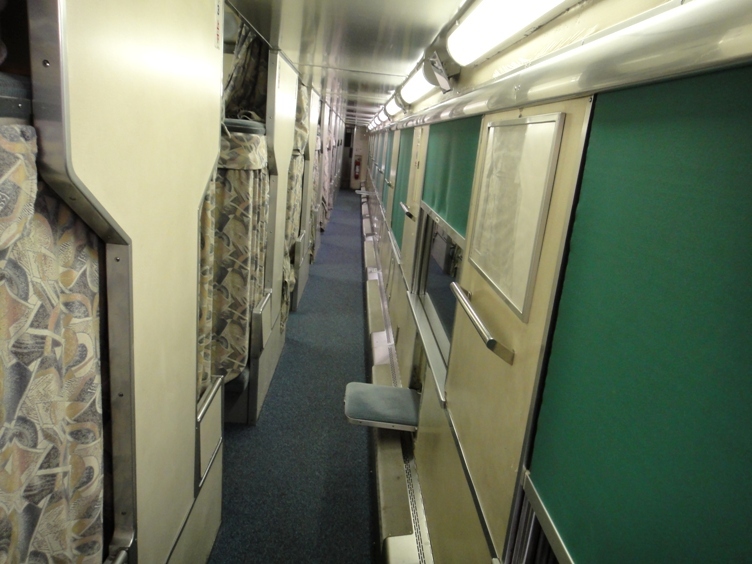 Akebono is a limited express overnight sleeper train service operated by East Japan Railway Company (JR East). 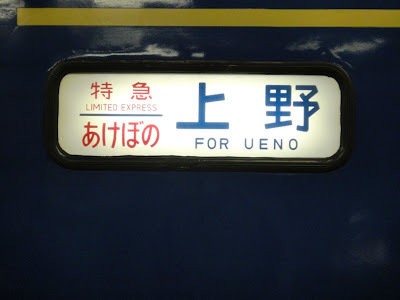 The train connects Aomori station in Aomori prefecture to Ueno station in Tokyo, and runs on Uetsu Main Line and Joetsu Line. 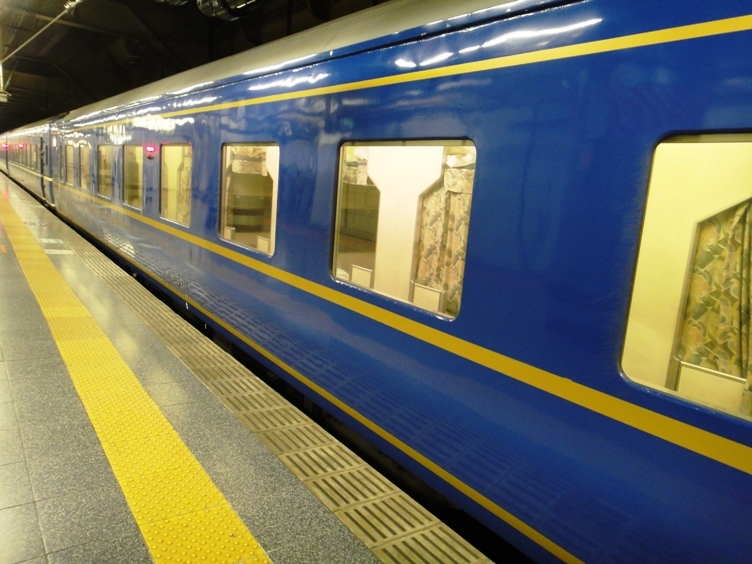 The train is formed of Series 24 sleeping cars based at JR East Aomori Depot. 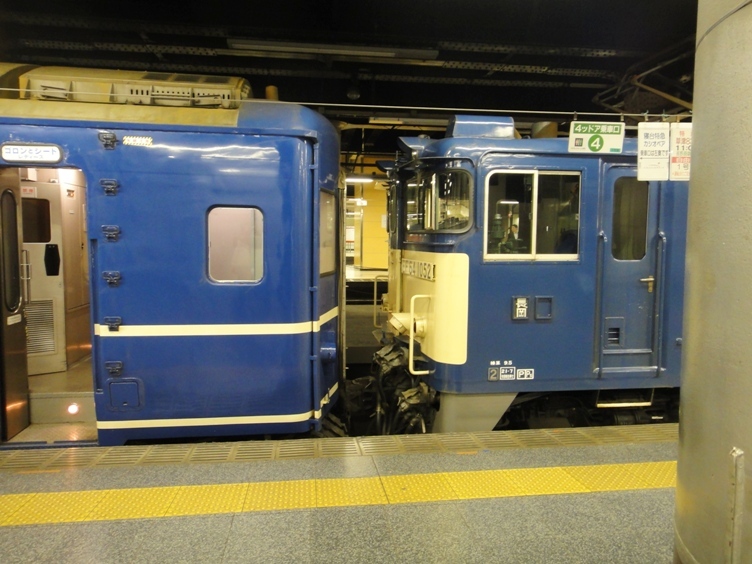 The train consists of 13 cars which includes a KaNi24 generator car at the Aomori end. The train is hauled by an Aomori Depot based EF81 dual-voltage electric locomotive between Aomori and Nagaoka, and by a JR East Nagaoka Depot based Class EF64-1000 DC electric locomotive between Nagaoka and Ueno. The maximum speed of the train is 110 kilometers per hour. The entire journey from Aomori to Ueno takes about 12.5 hours with many stops along the way. Akebono train began its operation in October 1970 and initially used to run on a different line named Tohoku Main Line. The train was hauled by an ED75 AC electric locomotive between Aomori and Kuroiso (in Tochigi prefecture), and by an EF65-1000 DC electric locomotive between Kuroiso and Ueno. 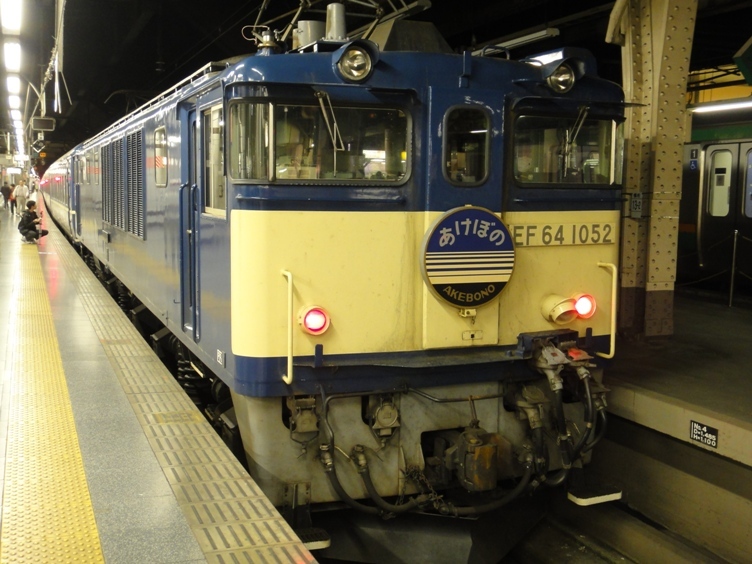 The train was later hauled by EF81 electric locomotive throughout, until March 2009. 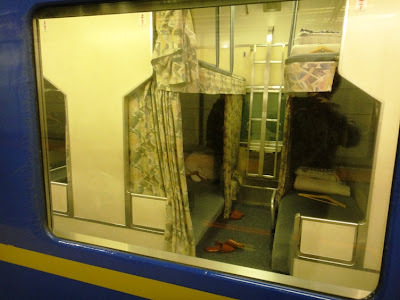 Akebono train offers four kinds of seat accommodations. 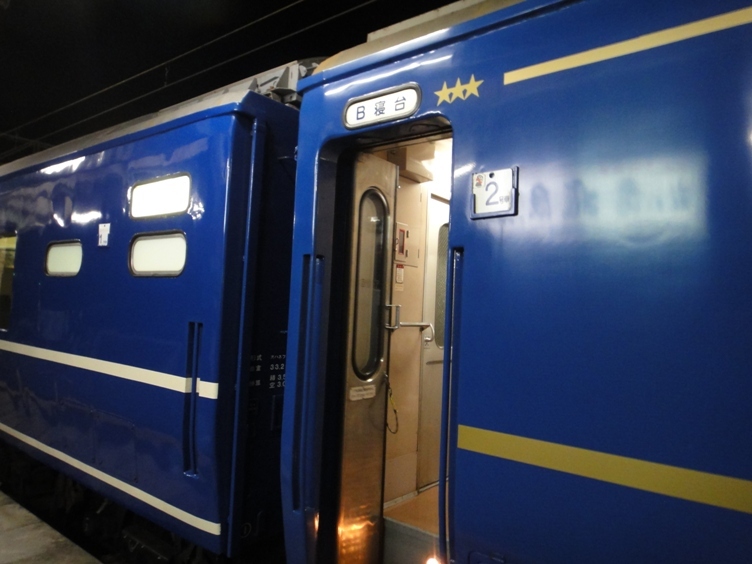 The first kind is Single Deluxe which is the best room in the train. 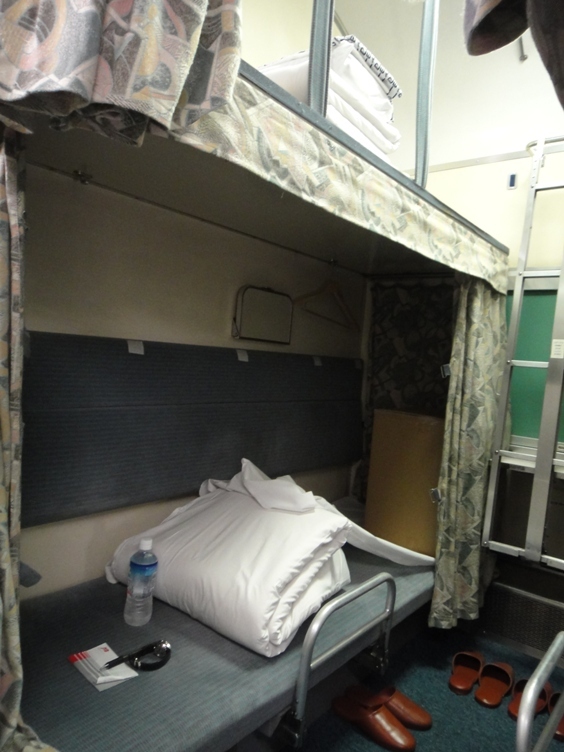 The bed is 196 cm long and 80 cm wide in size. This room has a small desk, a sink, and a television. The second kind of seat is called Solo, which is a basic kind of single room located at lower and upper levels. The third kind of seat is known as Type B compartment which is very basic sleeper with four beds in one compartment. There are two lower berths and two upper berths. The lower berths are 195 cm long, 70 cm wide, and 111 cm high while the upper berths are 195 cm long, 70 cm wide, and 95 cm high. 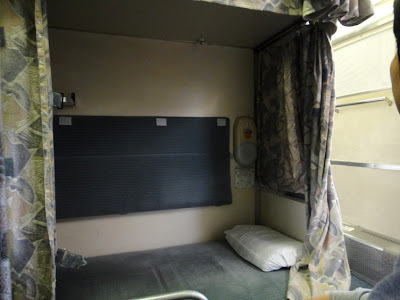 The fourth kind of seat is known as Goron-to-sheeto where the size of the bed is exactly the same as type B compartment but it is not necessary to pay any extra charge for reservation. People having Japan Rail Pass usually opt for Goron-to-sheeto. Hubby reserved two one-way tickets three days prior to our travel by Akebono train. 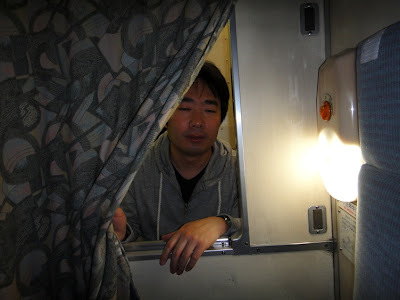 He opted for Type B compartment kind of seats for us, and paid 18160 Yen per ticket for the 9.6 hours journey from Akita to Ueno. 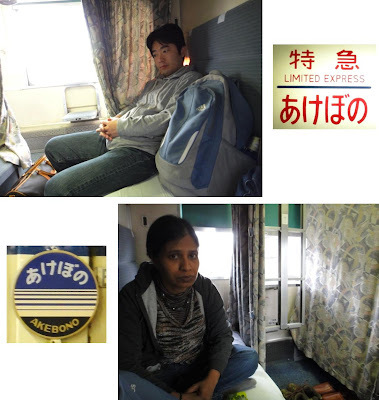 On March 30th, we left home in the evening and reached Akita railway station by our car at about 8.45 pm. We parked our car at a parking area located adjacent to the railway station, and then went to the platform for Akebono train. 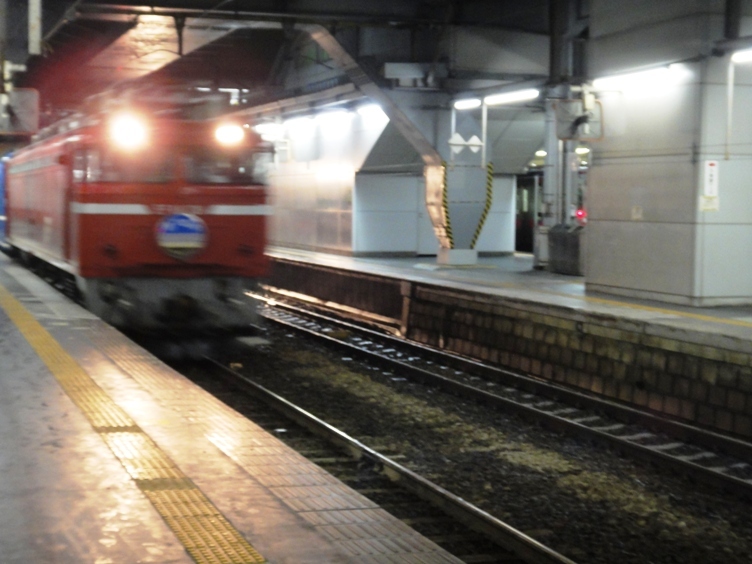 The train arrived from Aomori direction at about 9.17 pm. We boarded the train and it left the station at 9.23 pm. It is interesting to note that almost all kinds of trains in Japan usually run on exact time. This year March 30th was the last day of the fiscal and academic year in Japan, and therefore many people were moving to new places either for study or for new employment. 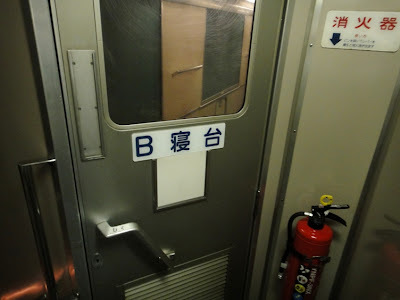 Because of this reason most of the seats in the train were already reserved much earlier than we expected, and so hubby and I got Type B sleeper seats in two different cars of the train. First we entered inside Type B compartment car having my reserved seat number. 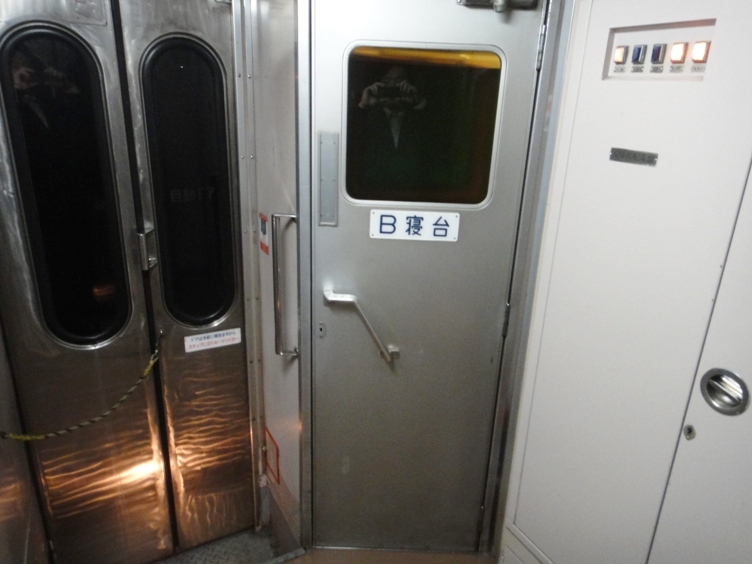 After entering inside the car, the door of the car closed and the train started moving. 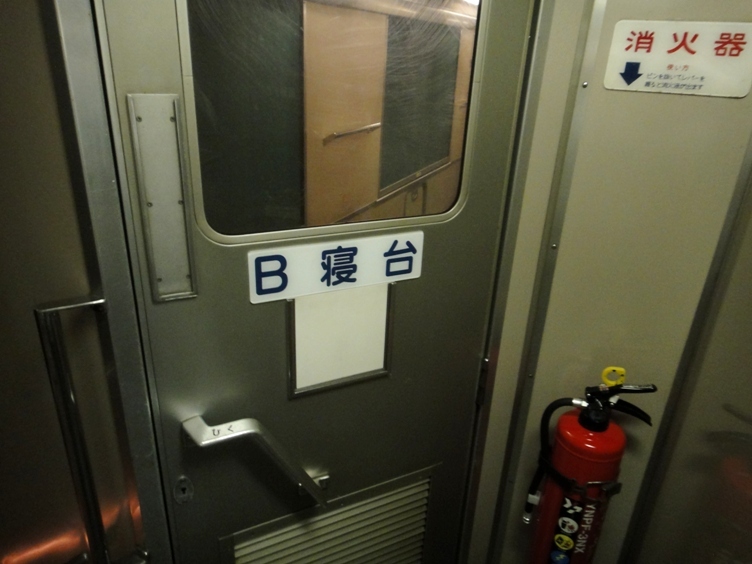 We realized that we were in one of the end section of the car, and we had to open yet another door to enter inside the Type B compartments. While walking down the aisle of these Type B compartments, we saw that the curtains of almost all the berths were drawn and people were fast asleep. 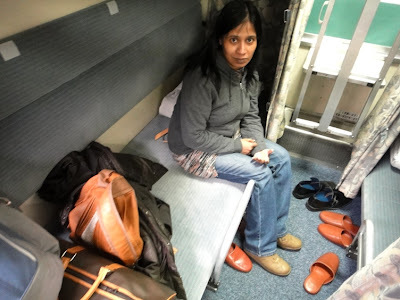 On reaching the lower berth of my compartment, we realized that the other three berths adjacent to mine were still empty, but soon at the next station people got into those berths. The sleeper seat was perfectly comfortable. 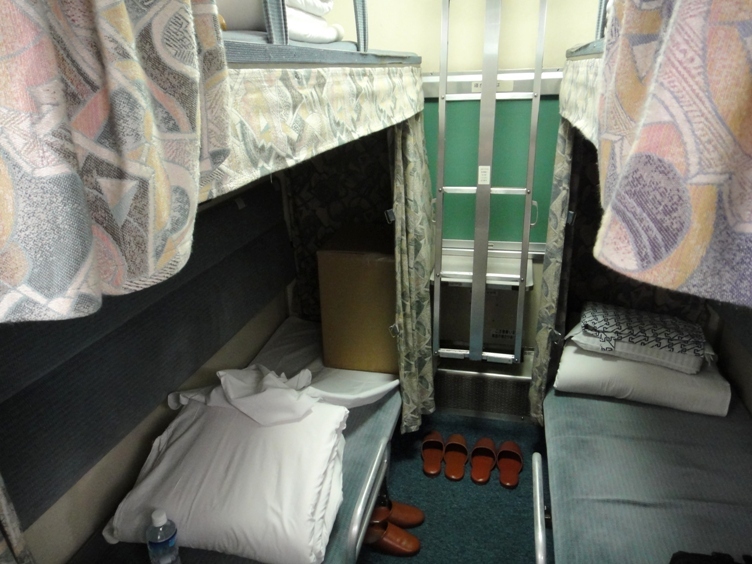 Each seat was provided with a pair of yukata robe, a pillow, a bed sheet, a blanket, a hanger, and a pair of slippers to walk around in. 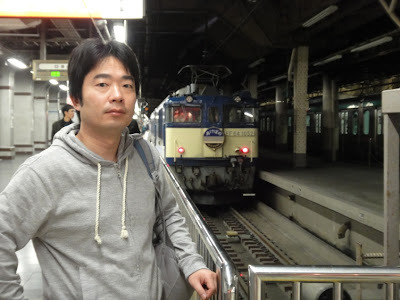 After about thirty minutes of chatting, hubby decided to go to his seat in the next car of the train. He drew the curtain of my lower berth which provided some degree of privacy. Anyway I did not wear the yukata provided at the seat, and tried to relax in the clothes I was wearing. Everything around me looked so neat and clean. I could not sleep for a while and looked outside the window for quite some time. I saw beautiful dark views of farms, trees, hills, mountains, towns and cities pass by. Sometimes it was just too dark outside to see anything but I enjoyed the journey. 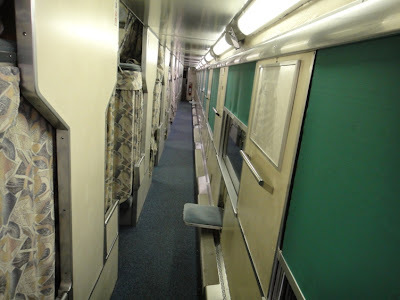 I felt nostalgic and was reminded of my childhood days in India when I used to travel a lot by sleeper trains. However I should say that everything was extremely clean and orderly inside Akebono train as compared with the sleeper trains in India. 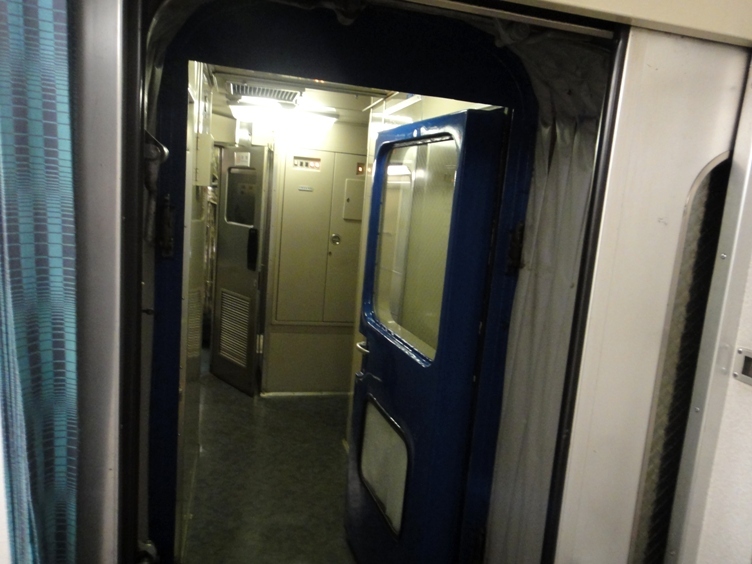 The entrance door of the car (left side of the photo) and another door (middle of the photo) as viewed from the end section inside the car. 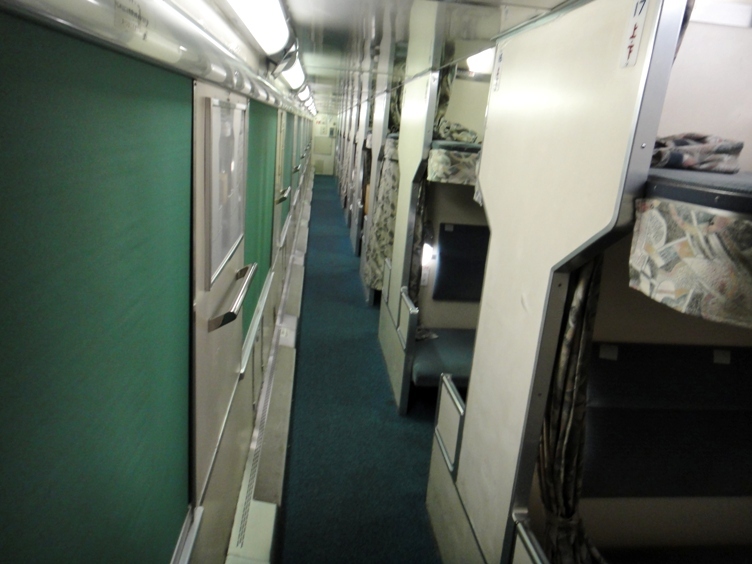 The door in the middle of the photo leads to the Type B compartments. 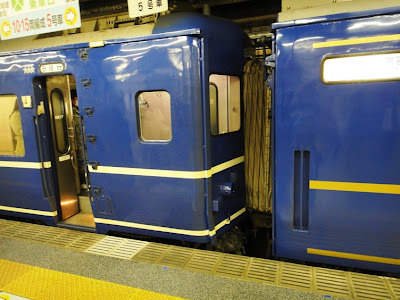 Hubby walked past the inter-carriage gangway doors between the two cars of the train and reached the adjacent car. While walking down the aisle of that car towards his Type B sleeper seat, he realized that several berths of many compartments were empty. 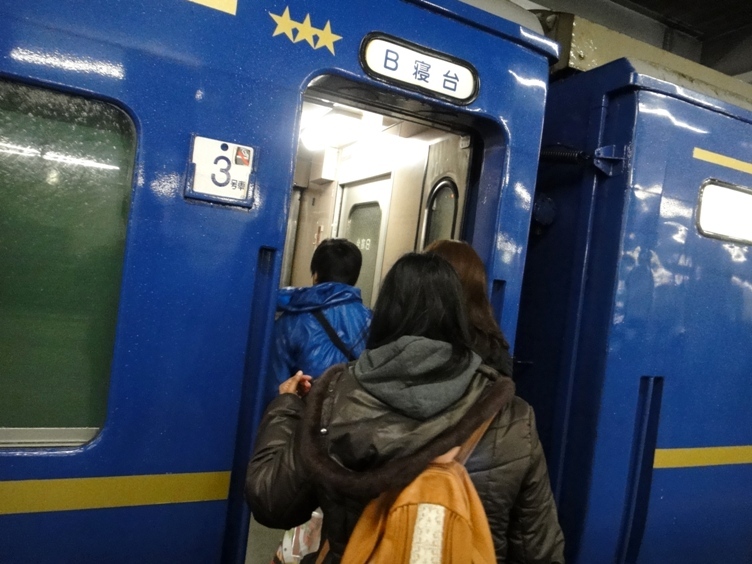 But after the train stopped at a couple of stations, many people boarded the train and eventually all the berths were occupied. 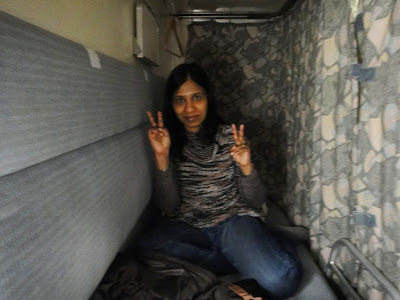 At about 4.45 am the next morning, hubby returned back to my sleeper seat and sat down. He got only a few hours of sleep and so he was still very sleepy. I took several photos of him in various moods. 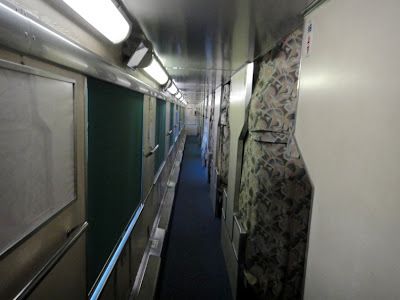 After about half an hour, the train stopped at a station where several people got off, and the other three berths in my compartment became empty. Soon hubby became fully awake and started walking up and down the aisle, looking out of the window, and taking photos and videos. I climbed up the steps in my compartment to get a good look at the upper berths. I also compiled a video of us sitting and relaxing inside the train. 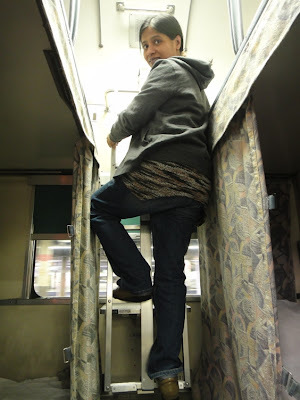 We really had a nice time inside the train. 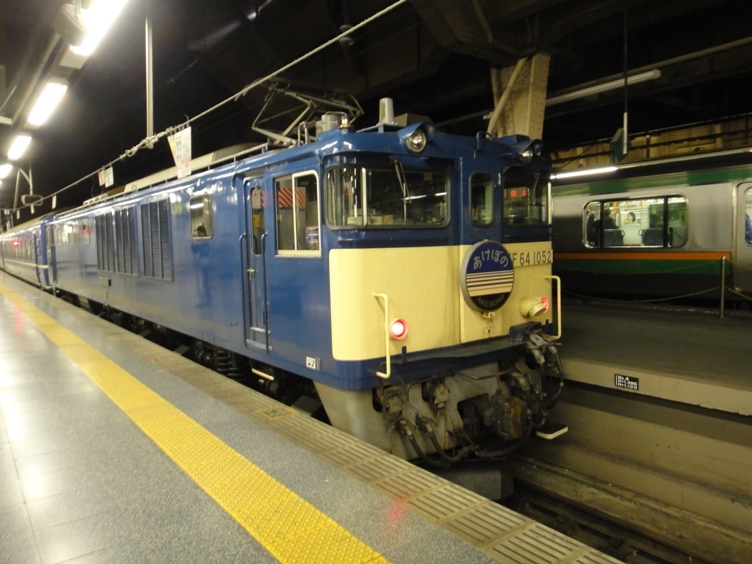 The train reached Ueno terminal station at 6.58 am. After getting off the train at Ueno station, we took many photos of the train for memories sake. In fact we took photos of the train from various angles and positions. We had a fun filled 575 minutes journey from Akita to Ueno by Akebono train. 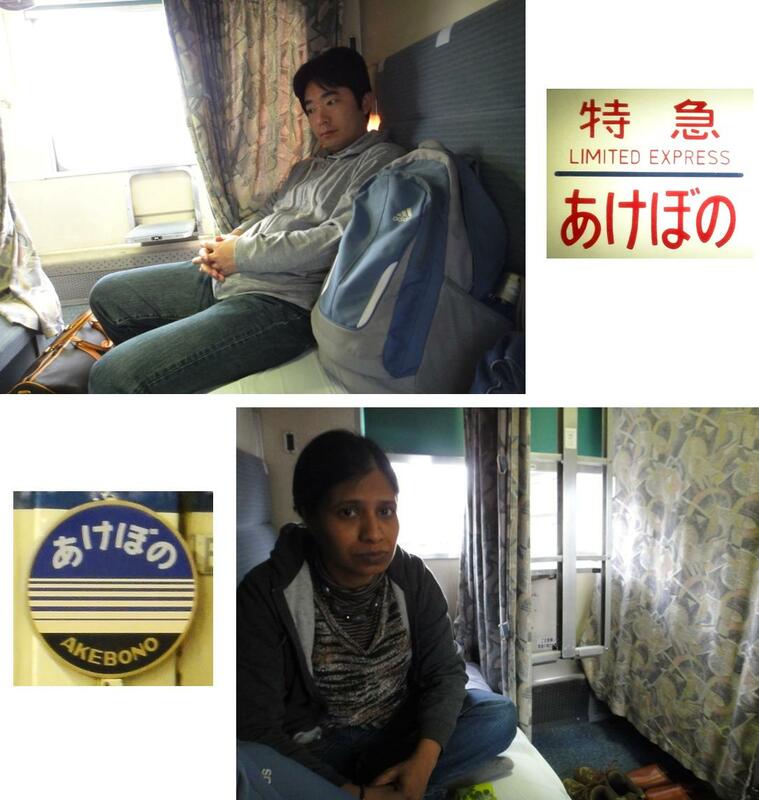 It was a comfortable and memorable journey, and we really had a nice time. I felt a tinge of nostalgia for memories of childhood travel by Indian sleeper trains. Later in the morning we went to see Ushiku Daibutsu Buddha statue in Ushiku city, about which I will write in the next post. 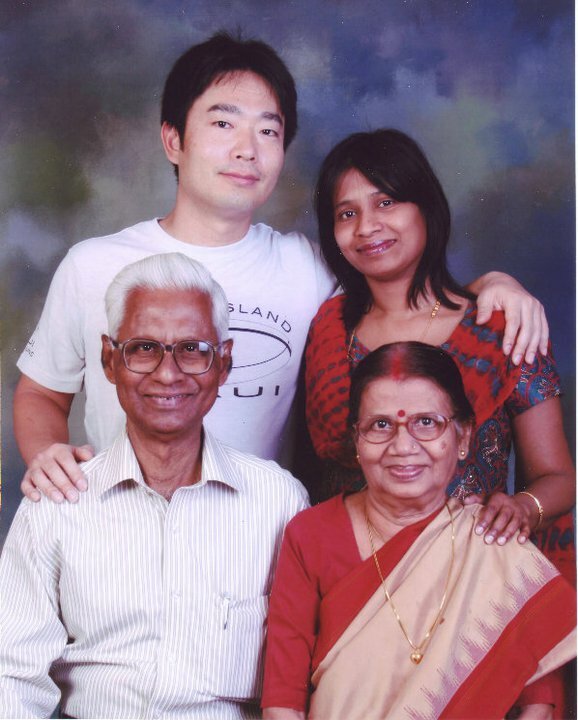 Thanks Narayana Rao and pon for liking the post. Hello! 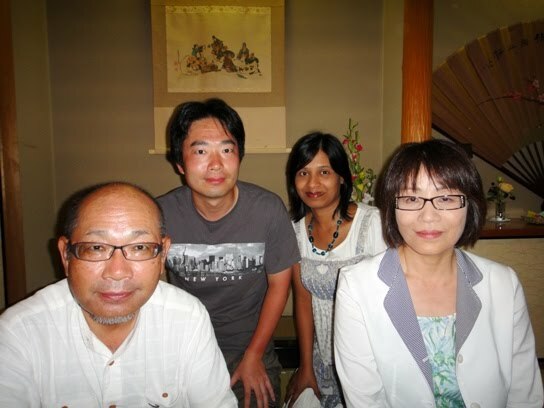 I sometimes read your blog and find it helpful for adjusting to life in Akita. I was wondering how your husband reserved the tickets for the Akebono train- did you do this in person at Akita station or can you somehow do it online? My Japanese is too poor to do it on the phone! Hello Bananallanah, Thanks for reading my blog! Hope you are getting used to Akita life. 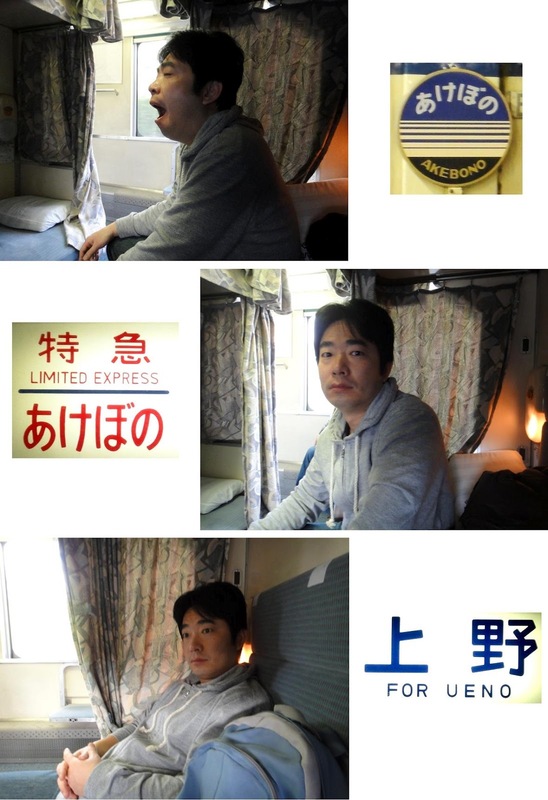 I asked my husband about the ticket reservation, and he says that he can not really recollect about this Akebono train seat reservation. But he has never done any reservation online. Most likely, he bought the tickets from the railway station near his office. Generally we can buy JR tickets from any railway station, so easiest way would be to visit Akita station and buy the tickets a week or so before the travel.